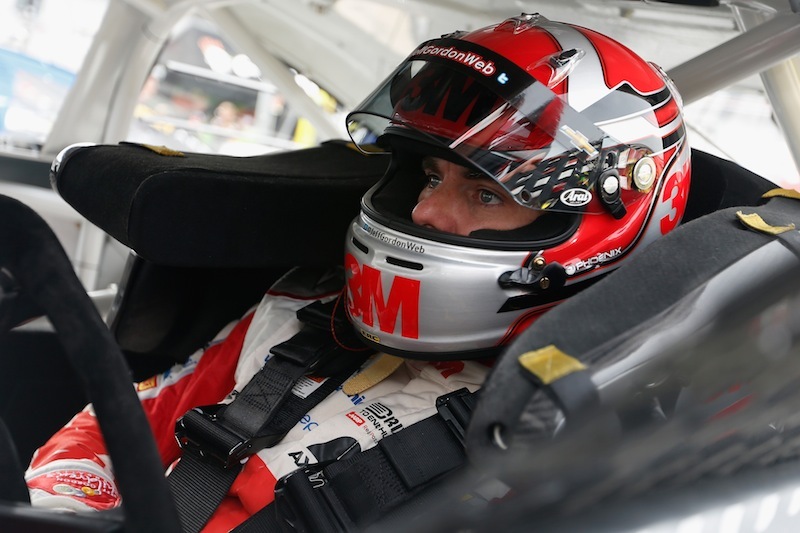 LOUDON, N.H. – To say the least, four-time NASCAR Sprint Cup Series champion Jeff Gordon was disappointed with his 23rd-place qualifying effort on Friday afternoon at New Hampshire Motor Speedway. Then came the first Cup practice on Saturday morning, when the weekend really turned sour for the driver of the No. 24 Hendrick Motorsports Chevrolet. Halfway through the session in preparation for Sunday’s race (1:30 p.m. ET on NBCSN), Gordon backed out of his garage stall, waved on by one of his crewmen. Unfortunately, he backed right into the path of the oncoming No. 15 Toyota of Clint Bowyer, who caved in the right rear quarter panel of Gordon’s car. Bowyer had the right of way in a garage area congested with onlookers and pit carts, and the damage to the nose of his Camry was primarily cosmetic. The same couldn’t be said of the right rear of Gordon’s car, and his crew went to work immediately to repair the quarter panel. Gordon got his Chevy back on the track in time for the start of Saturday’s final practice. Gordon was 22nd fastest in Happy Hour with a lap at 131.017 mph. As the NASCAR XFINITY Series season has progressed, Joe Gibbs Racing driver Daniel Suarez has become a fixture near the front of the field almost every weekend. Inevitably, his strong performance (three top-seven finishes in the last six races) has raised questions about possible participation in the NASCAR Sprint Cup Series next year. But Suarez would prefer to concentrate on the matters at hand. “To be honest, I feel like I’m getting comfortable right now where we are right now in the NASCAR XFINITY Series,” he said Saturday morning before qualifying at New Hampshire Motor Speedway. “My focus and my goal is in the NASCAR XFINITY Series, and I feel like I’m getting comfortable in this, and I think we’re getting better on this. New Hampshire pole winner Carl Edwards didn’t miss a beat when his No. 19 Joe Gibbs Racing team returned the car to race trim for Saturday’s two practice sessions. Edwards was third fastest behind Kevin Harvick and Jimmie Johnson in the morning session. During Happy Hour, Edwards posted the top speed of the day, 133.110 mph, beating Harvick (132.397 mph) and Ryan Blaney (132.213 mph) for the top spot on the speed chart. Kyle Busch, last week’s winner at Kentucky Speedway, brought sustained momentum to New Hampshire. Busch posted the fourth fastest speed in both Sprint Cup practice sessions.